The Bold and the Beautiful Spoilers: Liam and Steffy Rekindle Familiar Flame in Paris – Bonding Brings Secret Hookup? 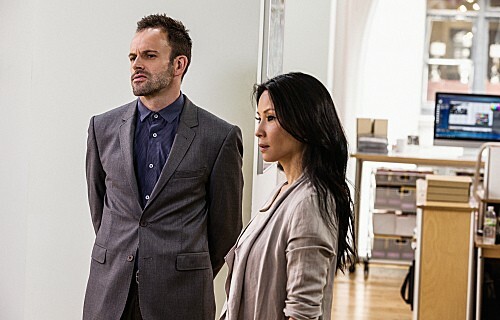 ELEMENTARY continues tonight on CBS with a new episode called, “We Are Everyone.” On tonight’s show Joan takes the advice of a friend and signs up for an online dating service. On last week’s episode (FULL RECAP HERE in case you missed it), When a well-respected mathematician is found dead, Holmes and Watson set out to solve a murder and the purpose of the highly guarded equation he was trying to decipher. Meanwhile, Watson is conflicted when the son of a former patient approaches her for a loan. On tonight’s show when Holmes and Watson set out to track down a civil contractor who leaked classified information, their lives are disrupted when they are targeted by the group of cyber-activists protecting him. Meanwhile, Joan takes the advice of a friend and signs up for an online dating service. Tonight’s episode looks like it is going to be great and you won’t want to miss it, so be sure to tune in for our live coverage of CBS’s Elementary at 10:00 PM EST! While you wait for our recap hit the comments and let us know how excited you are about the new season of Elementary. Also check out a sneak peek of tonight’s episode below! A man is writing a paper and the taxi pulls up to his stop. His card is declined as a multiple police cars pull up and he says they’ve found out and frozen his accounts. He sends the paper he was writing to a contact and runs away from the cab. Watson is with a friend at the park with her kids. Sherlock is texting her pictures and she tells her that he tests her sometimes and it’s a part of the work. Her friend is icked out and tells her she needs to keep her options open – Joan asks if it’s about dating and her friend gives her a gift certificate for a dating site and tells her she’s set up a profile. She tells her she doesn’t need help and her life isn’t that weird. She gets another text with a gruesome doll murder. Watson walks into his apartment and says that if he’s going to test her while she’s on a break he should make the questions challenging. He is glad that she has arrived and tells the mysterious Mr Mueller to state his business. He pulls out a TIME magazine with Kleinfelter (the man from the beginning) on the cover and tells them that he is suspected to have much more information than he should have and they are concerned for his safety. Mueller wants to hire Sherlock and Watson to bring Kleinfelter to them first so they can give him the proper safety. He asks if they’ll be in touch and Sherlock says that they will when they have Kleinfelter. Watson is opposed because it sounds like aiding and abetting. Sherlock took a picture of Mueller so tey can figure out who he really is. He says he can’t really be German because otherwise he would be better at backgammon. They are trailing the guy and Sherlock is saying that of course he has something nefarious in mind for Kleinfelter because of the ruse that he presented to them. They research him more and find out that the man was an associate of Kleinfelter’s and is actually CIA for Redding Enterprises the company that employed Kleinfelter. They followed him to the CIA front business and surmise that he’s hired them to run the guy down so they can eliminate him. Watson pulls up more information on Kleinfelter and finds that most of his complaints about human behavior are because of his inability to get a date with his neighbor. Sherlock is fairly certain that he doesn’t deserve to be stalked and murdered by his former employers. They pull up a woman named Celia who used to work with him as well. She tells them he had been downloading classified material near the time that he was finishing his book. Sherlock asked if Kleinfelter had had a personal attraction to her but she says she would be the last person that he would want to contact. Watson is sure she’s lying and Sherlock says they’re going to analyze her movements to find out how they’re communicating. They’re watching her and Watson asks Sherlock if he thinks they’re cut off from the world. He says they have created an alternate world worth living in. Sherlock says he’s lived most of his life knowing that romantic love is an illusion until he met a woman named Irene Adler who almost changed his mind but then she ended up being a criminal. He says that he feels freed of the need for love and is open to pursuing a life of meaning. They see Celia meet with the security guard of her building and do a bag swap and realize he’s the conduit to Kleinfelter. Sherlock pickpockets the doorman’s phone and after he steals the info from it he nukes it to destroy it because he’s found the guy is a clever hacker. Sherlock finds that Hector, the doorman, has been working with a hacking organization that wants to get Kleinfelter to safety. Watson goes to bed while he continues trying to get info from the hacker network website. She wakes to find a turtle on her bed as a gentle alarm clock. Weird. Sherlock says he spent the entire night finding a woman named Vanessa who had recently bought high end security equipment and he thinks is harboring Kleinfelter. He comments on their ability to be ahead of all the federal agencies currently tracking the whistleblower and asks her to remind him how empty their lives are… Watson picks the locks at Vanessa’s place and they call out for Kleinfelter but find Vanessa dead! Sherlock says there are skin fragments under Vanessa’s fingernails to check for DNA. But Bell says it won’t matter because they don’t have Kleinfelter’s DNA on file anywhere. They tell Gregson they think he was there but have no proof. Watson notices that one of the cops is fingerprinting a book that was by itself in a box that was isolated. She thinks that Kleinfelter brought it with him when he went there. Sherlock is stressing about the infuriating people that he’s arguing with online about information regarding Kleinfelter. Watson gets two phone calls about train sets and being naked and is confused as to what is going on. Twenty pizzas arrive to their house and her computer shuts down. Sherlock gives the pizza guy some money and says that he’s been duped and to make sure the pizzas find a good home. Sherlock tells Watson that Hector traced the phone before he destroyed it and now the Everyone network is targeting them for a life destruction by harassment. They go back to the station to go through some of the evidence again because Sherlock thinks Kleinfelter has gone back to the first place that he was hiding. The box of Kleinfelter’s things have the initials OCD on the side that tie them to an old Cold War agency that kept bomb shelters. They go to visit Milton – a colleague of Sherlock’s that knows New York better than anyone. He tells Watson that he has learned to not ask on the progress of the endless book Milton has spent his entire life writing and he suggests she do the same. Milton finds old records of a bunker near the Brooklyn Bridge that seems likely. They are getting in a cab when they are rushed by Secret Service agents who arrest them because they think Sherlock posted a blog plotting to assassinate the President. Watson tries to say that he didn’t post it and they are being harassed but Sherlock stays silent. [11:06:31 PM] Rachel Rowan: Sherlock tells the Secret Service he has no designs against this President or any other. He says that he is tracking an actual dangerous man but that if they call the Gregson to confirm his story he will tell them the identity of a man named Screwdriver that they’ve been tracking. They ask how he knows the name and he says he saw it on the bulletin board. He tells the one agent he’s in a divorce and has been manscaping and that the other needs to rethink being a vegan. They release Watson and Sherlock. Back at the house, a guy comes to the door – it’s one of the dudes on the dating site Watson has been flirting with. He tells her that her address was posted to her profile along with some provocative statements. He says he wanted to check on her and let her know. She tells him she’s okay, thanks him and asks to see him in a couple of days when her life normalizes. She comes back in to find Sherlock has their generator up and running and has linked to the neighbor’s internet to get their laptop working. He’s on the Everyone server trying to get them to back off of them. Watson asks about Irene again and says that what she did to him was terrible and she doesn’t think he’s gotten over it yet. He doesn’t want to get into it. Someone on the Everyone server is asking for naked photos of them. But then one person in the chat room says that it doesn’t matter what they do because Kleinfelter’s gone. Sherlock asks where and the person says far away. Another person types in all caps for everyone to stop talking. Sherlock types “Why not? Why not talk to me?” The chat room goes silent. Sherlock figures out that the only person that could silence all of the Everyone people on the server is Kleinfelter himself. He uses that chat pseudonym to do some research to figure out where he is and how he’s planning on getting out of the country. He surmises Kleinfelter would need a friend with a plane. Sherlock links a name in the chatroom to a man named Darren who has a private plane that’s leaving for Venezuela from New York that evening and figures out Kleinfelter is probably flying out on with him. They are watching the plane and Sherlock identifies Kleinfelter as the driver of Darren’s car. The cops cuff Kleinfelter and he tells them they can’t keep him. He says if they don’t let him go 14 people will be revealed who are in deep cover. He shows them information on one of the undercover agents to prove he can do it. The Captain says they have to let him go. Watson grabs Kleinfelter and tells him that it doesn’t matter where he goes because they’re still going to link him to Vanessa’s murder. The plane that Kleinfelter is on takes off. Watson asks if they have evidence linking him to Vanessa’s murder if Venezuela will harbor him. Turns out she stole his watch so they can get DNA to tie him to Vanessa’s murder. Sherlock is surprised and impressed because they haven’t gone over the pick-pocketing lesson yet. Watson says she’s been reading about it on her own. Sherlock almost gives her a congratulatory pat but it gets awkward. Sherlock sneaks up on Mueller in his office. He pulls out a backgammon board for them to play while they talk. He tells him that Kleinfelter is on his way to Venezuela and that he will escape justice and whatever “justice” he had in mind for him. He tells Elliot about Kleinfelter’s threat to expose the undercover agents. Sherlock says Mueller doesn’t seem surprised because he obviously already knew he had the names and just hasn’t told the government yet because he doesn’t want the agency to be in trouble. Sherlock tells him that he should release the names to the government so that Kleinfelter has no leverage. Sherlock says he knows he was a former field agent himself and won’t leave them out there to die. Elliot says he’s bluffing. Sherlock stays silent. The news report shows Kleinfelter being arrested for Vanessa’s murder which he confessed to in exchange for the government not pursuing the death penalty for the espionage charges. Sherlock is reading a letter that he wrote to Irene years ago talking about his feelings regarding love. Watson walks in from her date and said that it was fun but there weren’t really any sparks. She tells Sherlock she thinks it’s sad that he’s given up and she knows he has a lot to offer and she shouldn’t be the only one who gets to know him. Sherlock goes back to the letter asking if really getting to know someone else is a worthwhile pursuit. We hear Irene’s voice saying that she wants to continue to know him and will be waiting for him to write. The letter is signed Jamie Moriarty. General Hospital Spoilers: There’s A New Maxie In Town! Heading To Disneyland? Here Are The Rides You Cannot Miss! Kate Middleton news, photos, pictures, galleries and videos. Are Gillian and David A Couple? We Have The Answer HERE! Kim Kardashian photos, pictures, galleries and videos. Who's Dating, Who's Married, Who's In Love.